Standing at 18m high, 30m across and 36 km deep, the Arc Nova will make its arrival to Tokyo Midtown, Roppongi. 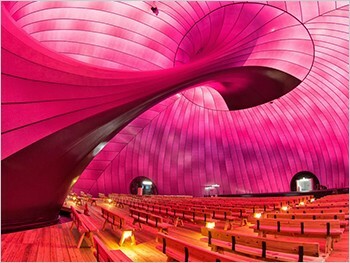 This inflatable and portable concert hall was made in response to the 2011 Tōhoku earthquake and tsunami, to provide music to those affected in the area. The Lucerne Festival is one of the most prestigious classical music festivals in Europe, which initiated this event right after the devastation with the aim of bringing music and touching hope. This year, the Arc Nova will display photos from the concerts held in the Tohoku region, and host concerts in the hall. Performing artists and schedules TBA on their website.